The illuminator in the 3D World viewer is an edge-lit panel. It works by shining a light into the polished bottom-edge of a lexan sheet. Through internal reflections, the light is directed out one of the flat surfaces of the sheet. It provides a very even light in a very thin package. I’ve always considered edge lighting to be the most desirable way to light a slide viewer. I’m very pleased to see 3D World using the concept in their newest viewer. Several years ago, I modified one of the 3D World steal-the-light (STL) viewers and inserted an edge-lit panel. I used a panel with a fluorescent light source, and powered it from the wall rather than from batteries. The result was an extremely thin, very bright light that hid in the back of a my fixed-focus viewer. In the intervening years, I have considered installing a battery pack in my illuminated viewer, but the power demands of the fluorescent light made that impractical. I have also tried several times to build an edge-lit panel using LEDs in place of the fluorescent tube. The result would have been an instant-on light with a smaller electronics package and lower power consumption. I was never able to design an LED-lit panel which provided light sufficiently even for slide viewing. Thank goodness 3D World has succeeded where I was stymied. 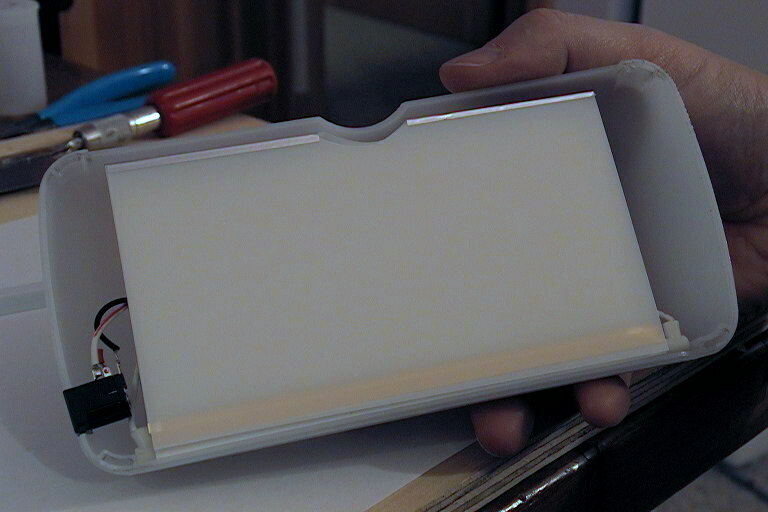 They have designed and built an LED-lit panel suitable for use in a slide viewer. Because it is instant-on (unlike fluorescent), it can have a momentary switch. Because it has a momentary switch and LEDs with low power consumption, it can be battery powered. Because it’s edge-lit, it is very thin and because it’s very thin, the final viewer can be very compact. An ideal viewer light will be light weight, sturdy, inexpensive, evenly lit, bright, long lasting, and of a daylight color temperature. All of these attributes can be hard to find in a single product, but I’ve made some measurements of my lights for comparison. The electrical measurements for the Saturn viewer and the STL viewer are taken from my 2005 notes. 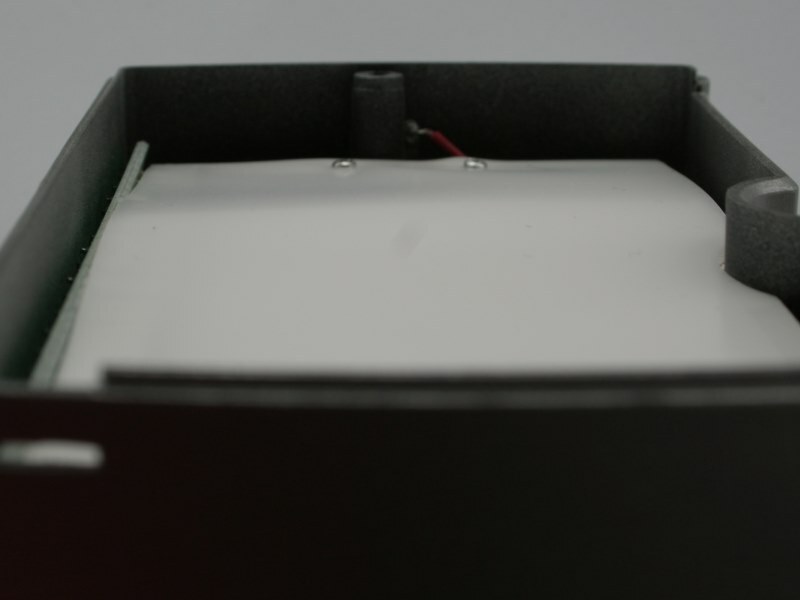 The electrical measurements for the 3D World illuminator were made with a Fluke DMM. The light measurements were made with my analog Sekonic L-208. The light measurements were made through a viewing lens not directly on the illuminators. From these numbers we can see that the LED illuminator from 3D World requires only 1/3 the power of my fluorescent lamps yet produces a similar amount of light. The LED source is much sturdier than my lamps and is instant-on. With these power requirements (and battery data sheets from Duracell), I estimate that a set of three alkaline AA batteries would power the light at an acceptable brightness for over three hours. As shipped in my viewer (admittedly as single sample from a relatively early production), the illuminator was poorly assembled. Having spent several years working with edge-lighting in slide viewers, I’ve become rather sensitive to their construction details. To provide the most even and artifact-free illumination, the “sandwich” must be assembled carefully and kept free of dirt. The 3D World illuminator required a few adjustments to let it perform at it’s optimum. As shipped, the diffuser (the top layer of the sandwich) was glued along three of its edges to the lexan (center of the sandwich). The sandwich was then screwed to the back of the viewer. There were wrinkles in the diffuser which let dirt get behind the diffuser where it was very visible and distracting when viewing slides. The wrinkles also produces slight unevenness in the light which wasn’t terribly noticeable behind slides but was still a minor distraction with some images. To correct these two problems, I removed the sandwich from the back of the viewer, peeled the diffuser off, removed the dirt, trimmed a tiny bit off the edges of the diffuser, enlarged the screw holes, reattached the diffuser and reinstalled the illuminator. I reattached the diffuser with a strip of mylar tape around the perimiter. This let me get it smoothly down on the lexan and the enlarged screw holes let me reattach it to the back without introducing distortions. During reassembly, I noticed that the LED strip along the bottom of the lexan was able to pivot away from square. The evenness of the light in the panel was very dependent on how precisly square the LEDs were positioned. I will probably insert a thin strip of foam below my LED strip to ensure it remains pointed directly into the lexan sheet so I will get the best possible light for my images. 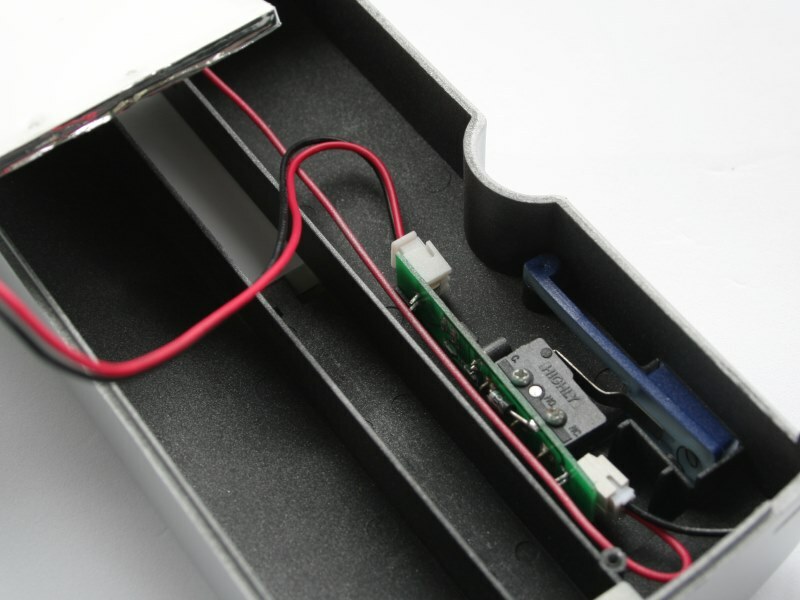 The eighteen LEDs in the illuminator are wired in parallel and attached to a strip of circuit board. Power to the LEDs comes from a separate circuit and appears to be a regulator. 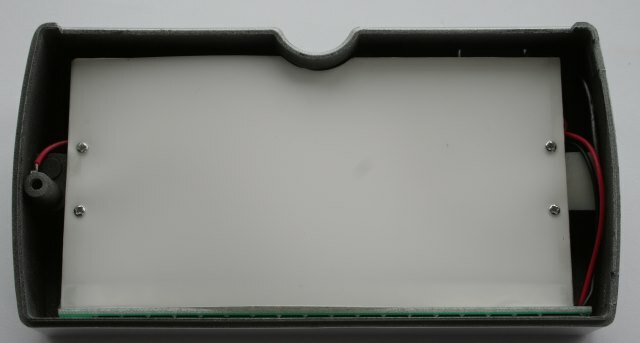 The momentary micro-switch is also located on this board and is pressed by means of a pivoting plastic button through the top of the case. The battery compartment runs the width of the viewer and accepts thee AA cells in series. Please be careful if you decide to change any of the power supply components. Having “been there – done that”, I can say that the power supply quits somewhere between 4.5 and 6.0vdc. 3D World has generously replaced my power supply, but I strongly recommend that you not exceed 4.5vdc input. If you install a jack for external power, please be sure to use one which automatically disconnects the battery pack before delivering power. I am impressed with the illuminator 3D World has created and think it represents a fantastic value. It isn’t perfect but you must consider that it’s thin, robust, has good color temperature, will run for several hours on its batteries and is inexpensive enough to be used in a viewer that sells for less than $100. You must also conisder that it is being produced in large quantities. My fluorescent panels offer a bit more even light, require at lest 30 seconds to get up to full brightness, cost about $100 build, are fragile and consume three times more power. I don’t anticipate building any more of my panels now that 3D World has produced theirs.